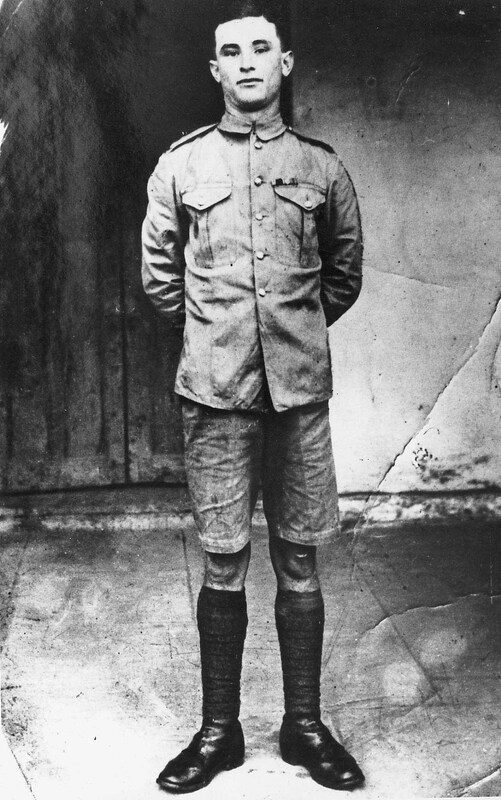 James Daly, leader of the Connaught Rangers’ mutiny in Jullunder, Punjab, in June 1920, the only one of the 88 court-martialled mutineers to be executed. William Coman was one of the 59 given a fifteen-year sentence. Following an agreement between the British and Irish governments, Coman and the other jailed mutineers were released in December 1923. William Coman was born in Cashel, Co. Tipperary, in 1900. He lied about his age and enlisted in the British Army during the First World War. He was wounded during the Palestine campaign and also served in Mesopotamia before being sent to India. In June 1920 Coman, along with a number of others, took part in what became known as the Connaught Rangers mutiny at their base in Jullunder, Punjab. Following the collapse of the mutiny, the leading mutineers, including Coman, were court-martialled. One of the mutineers, James Daly, was executed. Coman received the comparatively lighter sentence of fifteen years’ imprisonment. He was initially imprisoned in India before being transferred to a prison in England. Coman would later claim that during this imprisonment he went on a ten-day hunger strike as well as 36 days on bread and water only. 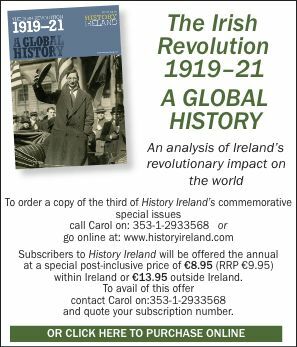 Following an agreement between the British and Irish governments Coman and the other jailed mutineers were released in December 1923. Coman returned to a hero’s welcome in his native Cashel. A public reception was held and money collected for him, but he was soon in trouble with the law. In February 1924 he was arrested, tried and convicted of the robbery of a Dublin man and sentenced to ten years in jail with twenty strokes of the lash. The trial judge commented that Coman ‘had produced a document to prove that he had been a great man in India’. The judge was of the opinion, however, that ‘Tipperary would be a much better place if he had stayed in India whether a mutineer or anything else’. After his release from prison in Ireland, Coman emigrated to England and was living in the Paddington Green area of London when, in 1936, he heard from his friend Michael Davern (Fianna Fáil TD 1948–65) that the state was offering pensions to Connaught Rangers mutineers. He immediately wrote looking for the pension and followed it up with a second letter, this time from Birkenhead, Merseyside. Coman claimed to be destitute, living on charity and with no means of returning to Dublin. 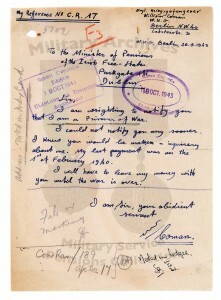 It is clear from his Military Service Pension file held in Military Archives that Coman was either illiterate or semi-literate, as on many occasions letters were written by others on his behalf. For example, the Birkenhead letter was written by an Irish priest called Canon Curran. 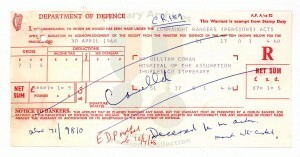 Coman returned his completed pension application form to the Department of Defence in August 1936. In it he gave two addresses: 44 Parnell Square, Dublin (though there is no evidence that he actually lived at that address), and Paddington, West London. 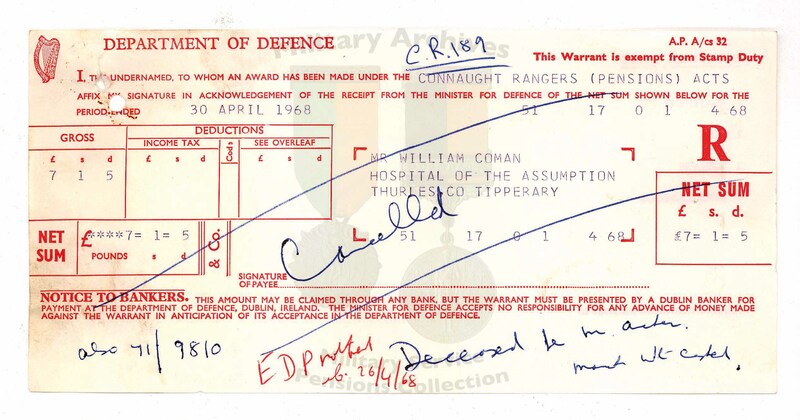 Michael Davern was actively supportive of Coman’s application: he forwarded to the Department of Defence a letter signed by himself and nineteen prominent members of the Cashel community supporting Coman’s application. These signatories included the dean of Cashel, members of the urban district council, peace commissioners and local members of Fianna Fáil. John Maher, Cashel’s town clerk, also wrote a detailed letter of support, recounting how he met and befriended Coman in Maidstone Prison in late October or early November 1920. Coman was awarded a pension of 10/6 per week and received back payments of £65-10-3, the equivalent of four months’ wages. On receipt of the money he deserted his wife and young child and returned to his native Thurles. His wife wrote from Bayswater, London, to the Department of Defence in June 1937 inquiring as to his whereabouts. His stay in Ireland was short, however. By April 1938 he had moved again and lived at a number of addresses in England and Wales over the next two years. By March 1940 he was living in Chatham, Kent. The move to Chatham set the scene for the next incredible part of Coman’s life. Chatham was the headquarters of the British Army’s Royal Engineers. Britain was at war again and Coman was called up to the British Army in January 1940. It is not clear whether they were aware of his previous record. He joined the 670th Artisan Works Company, part of the Royal Engineers, and landed at Le Havre in March 1940 to join the British Expeditionary Force (BEF). Germany invaded France in May 1940, and during the bombardment of Rouen Coman became separated from his British Army comrades. He somehow acquired civilian clothing in the town of Vermelles, some 250km north of Rouen, and began a new life hiding out in German-occupied France. He lived with a Monsieur and Madame Cornet until he had a serious argument with them and left in early 1942. He then turned up on 19 April 1942 at an inn run by Monsieur and Madame Boutry. He produced a revolver and demanded food. He was arrested and handed over to the Germans for trial. Being a British soldier caught in civilian clothes with a revolver in German-occupied France was very serious, as he could be considered a spy or a secret agent and shot under the Kommandobefehl or Commando Order. Coman must have quickly realised the scale of the trouble he was in. 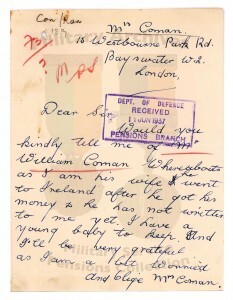 With the permission of the German court, he sent letters to his sister and to Dan Breen, Fianna Fáil TD. Breen passed his letter on to the Department of External Affairs, who involved the British. It quickly became apparent that Switzerland as the protecting power was already involved in Coman’s case. 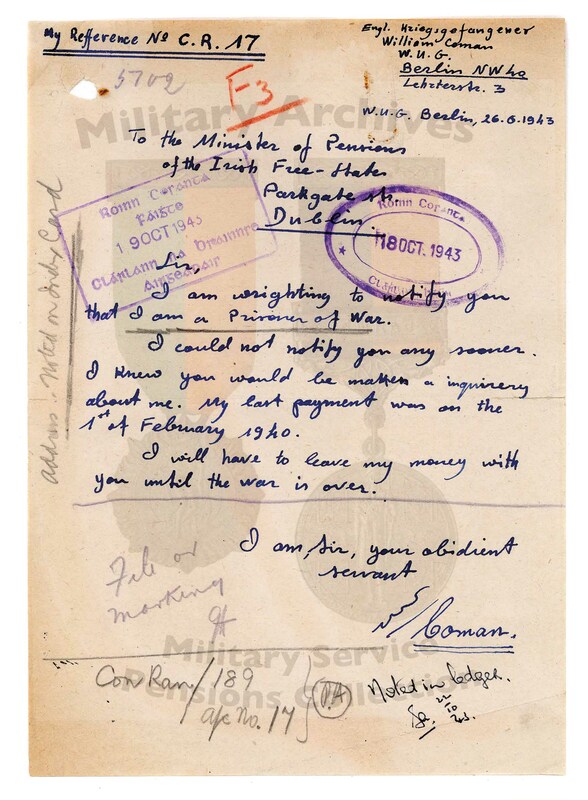 Francis Phillips, chair of Cashel UDC, also took up the case and wrote to Senator Bill Quirke to see whether he could ask the German minister, Eduard Hempel, to help with the case. From a German point of view, the most serious aspect of Coman’s case was the fact that he possessed an unauthorised firearm. Coman told the Germans that he had acquired the gun from a French navvy called Dassonvalle. Coman was tried on 28 September 1942 at Number 670 Arras Branch of the Field War Court of the Supreme Field Command and was, according to Coman, sentenced to death. The Irish authorities were notified in September 1943 by the Germans that Coman’s death sentence had been commuted. He was then transferred to Plötzensee Prison in Berlin, notorious during the Nazi era, where many members of the anti-Nazi resistance, including the Kreisau circle, were executed. Coman by then had other things on his mind. He wrote to the Irish authorities from Plötzensee Prison to tell them that he was a prisoner of war in Germany and asked that they keep his pension until the war was over. 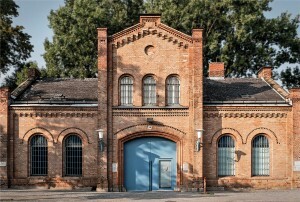 Sometime later he was moved to Stalag 20a near Thoun in Poland. Towards the end of the war the prisoners from Stalag 20a were moved out of the camp and marched west, away from the advancing Soviet armies. The prisoners, possibly including Coman, were liberated by advancing American soldiers. 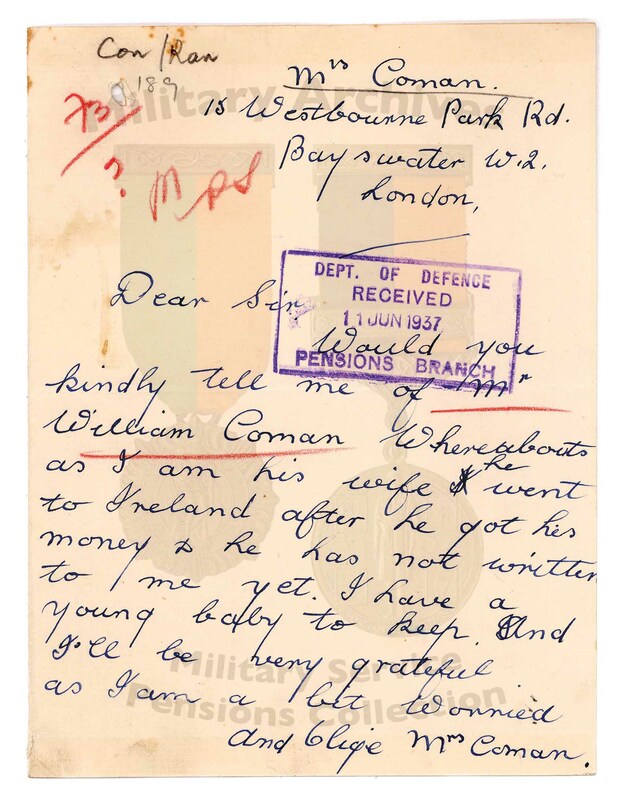 Coman was repatriated in May 1945 and lived in Britain for a time before returning to Ireland. Upon his return he came under surveillance from Irish Army intelligence (G2), but they quickly judged that he posed no danger to the state. He was, however, coming to the attention of the local Gardaí. In May 1947 Coman was convicted in Cashel district court of failing to pay a bus fare and was sentenced to one month in gaol. 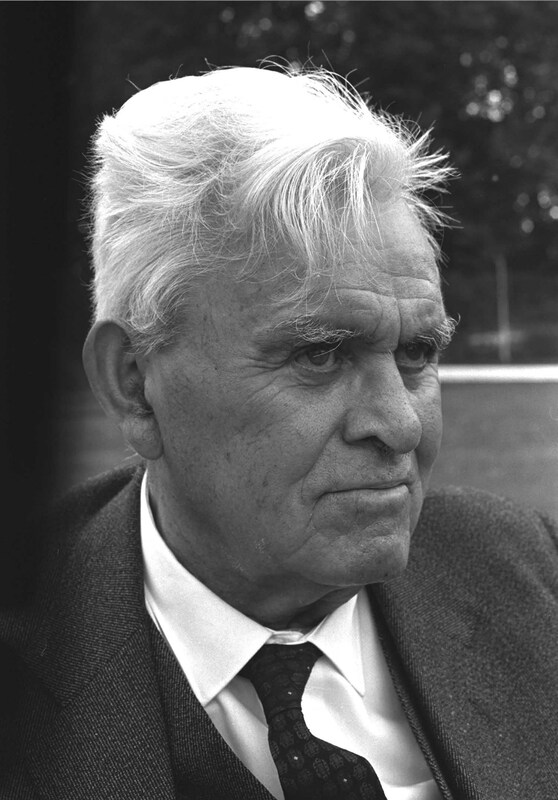 In 1950 he was sentenced to four months for breaking and entering and larceny in Thurles district court. By 1955 the law had caught up with him again; he was convicted of stealing a bicycle and sentenced to six months’ imprisonment at Galway district court. Based upon this and his earlier convictions, under section 16 (a) of the Connaught Rangers (Pensions) Act 1936 Coman forfeited his Connaught Rangers pension from the date of the conviction. After his release he was sent a final balance of £3-3-0. Michael Davern, now a TD, again took up his case. He wrote to the Fine Gael TD and minister for defence, Seán MacEoin, asking that the pension be reinstated. The civil servants in Defence replied that there was nothing the minister could do as there was no provision in the Act to allow a minister to reinstate a pension. After the general election of 1957 Davern wrote to the new Fianna Fáil minister for defence, Kevin Boland, commenting that Coman had an extraordinary career and ‘to say that he has been mentally ill for some years past is putting it mildly’. Boland made it clear that he wished to restore the pension but was advised by the attorney general that he did not have the power to do so. The legislation passed all stages in the Dáil and Seanad by 15 March 1961, and was signed into law by President de Valera on 21 March 1961. Three days later Kevin Boland and Finance Minister James Ryan approved the restoration of the pension to Coman, who at that stage was a patient in the Hospital of the Assumption, Thurles. By May 1965 Coman had moved to the Wandsworth area of London, where a local Irish Catholic priest helped him to fill out his application for the Irish old age pension. He returned to Ireland in July 1965 and stayed in the Thurles area until he passed away in the Hospital of the Assumption, Thurles. His last pension mandate for payment of £7-1-5, dated April 1968, was cancelled and returned to the Department of Social Welfare. Kevin Finnan has recently completed an MA on internment in Ireland during the Emergency at Mater Dei Institute, Limerick. A. Babington, The devil to pay: the mutiny of the Connaught Rangers (London, 1991). S. Longden, Dunkirk: the men they left behind (London, 2009). C. Waite and D. La Vardera, Survivor of the Long March: five years as a POW 1940–1945 (London, 2012).